A large swath of Canada, from the Prairies to Nova Scotia, is under a deep freeze. Temperatures in Winnipeg are dipping down to –36 C Monday night with a windchill of almost –50 C. In Windsor, which is typically the warmest spot in Ontario, the overnight temperature will dip to –27 C with a windchill of –40 C.
Even in parts of the U.S. Midwest, temperatures are expected to have a wind chill of –50 C.
This may leave some, like U.S. president Donald Trump, wondering where global warming has wandered off to. 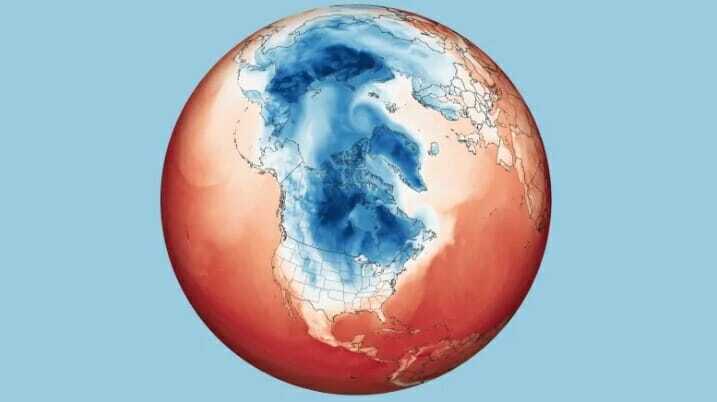 The fact is, it’s climate change, or global warming, that’s behind this extreme cold. Ever since the bitter winter of 2014, a new winter-weather catchphrase has been making the rounds: polar vortex. The polar vortex is nothing new. It’s just that it typically encircles the north pole. However, in recent years, it seems to be meandering southward every so often. Nicole Mortillaro – CBC News – Posted: Jan 31, 2019.